Facebook ads appear on the right side of a user’s Facebook Page. 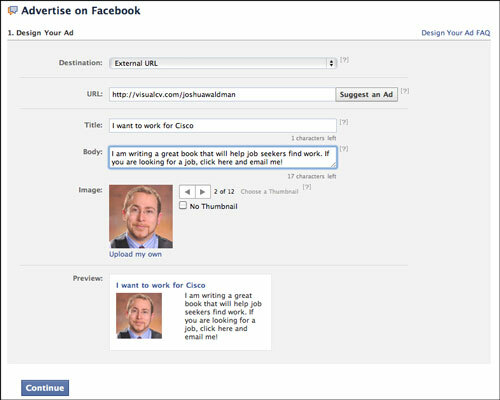 If you take out an ad for yourself, that ad may just lead to a connection that in turn leads to a job. Everyone sees different ads because the ads are targeted to you based on your demographic and your interests. This link is located at the bottom of any page on Facebook. 2Click on the green Create an Ad button. Enter the domain name (URL) of where you want your ad to direct people when they click on it. You may choose to link your ad to your LinkedIn profile, VisualCV, Innovate CV, personal blog, or a landing page that captures visitors’ information and tracks who downloads your résumé. 3Type in the Title and Body of your ad and select the image you want to use. Spend some time crafting your title and body copy in a word processor before logging into Facebook. Think about what you can say to get the attention of your ideal person. Remember that you aren’t selling yourself yet, you’re just selling the click. Your goal with the ad copy is to get the person to click. 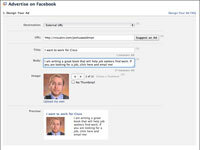 Use a version of your LinkedIn profile picture for the image. Doing so gives your brand a sense of consistency and professionalism. 4Click on Continue and enter your demographic information. This step is where you filter it down so that only people who work in your target company see the ad. Be as specific as you can with your selections. Even if your ad is shown to only 1,000 people, that’s okay. 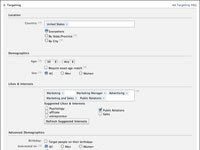 Note that you have to click on Show Advanced Targeting Options in order to choose the workplace. 5Choose your budget and time frame. The more you spend, the more your ad shows up. Think about spending about $10 per day. This doesn’t mean you will pay $10 a day, it just means your charges won’t exceed that amount. 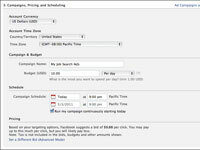 Run your ad for one-week intervals. Each week, change something in your campaign. Then compare each week’s results. If your change increased the number of people clicking, then it was an improvement. Continue the campaign until you feel you’ve made progress in your job search. 6Review and place your order. You’re prompted to enter your credit card information at this point. Before you do, take several moments to look over all your ad information very carefully. Make sure everything’s correct and that the ad looks the way you want it to. Tracking your campaign in real time is important so that you can make small adjustments to improve it. 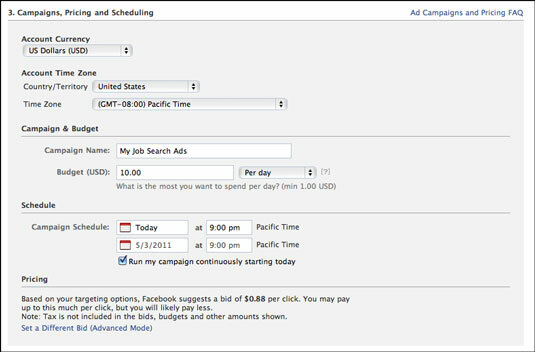 With Facebook’s ad analytics, you can see how many clicks you’re receiving and how much money you’re spending. 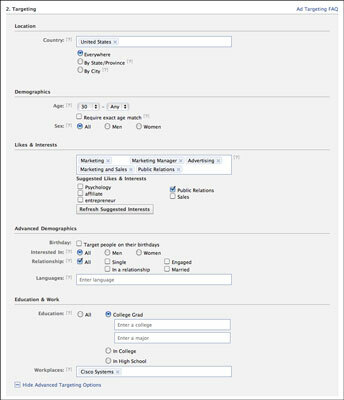 You can then widen your demographic filters if you aren’t getting enough clicks to expand how many people see the ad. Or you can make small changes to the ad copy if you think it can be more effective.